Did you hear that? That was my head hitting the desk. Just turned in my Field Study Linen artwork for release in January. Just turned in the very, very, very last photo for my Needleworks book for October. Just called the Mac mothership and told them to go ahead with the repairs to my laptop after I found it closed and filled with milk at the beginning of the week, compliments of my dear, sweet, milky Roman. (As it turns out the hard drive was not as lactose intolerant as the rest of the machine, so thankfully all was saved.) Just decided that I will go ahead and make changes to my living room that I have been thinking about. This was inspired by the first change taking place without my consent in the form of a 200lb mirror over the mantle snapping free from it's hanging wire, falling forward taking with it my whole collection of vintage (and otherwise favorite) yellow vases to the floor and shattering into a million pieces. This was just about 2 minutes after I had walked in from taking my laptop to the emergency room. That was Sunday. That's how the week started. Since then, I have assumed the underdog stance and plowed through my work productively + had some of the best, long, hard evening runs ever. One in a rainstorm rife with lightning and thunder. Was not going to wuss out. I was waiting for my ipod to fail, electrocute me or generally just make me more underdogish like, but it worked. So I would like to personally thank Jack White and his mad piano and guitar for getting me through the rain and the run. I shall now to commence to making like it's Friday, since it is Friday, and I don't plan to work through the weekend like I have for the last 9 and I will forgive myself for overscheduling my summer and I will stare at the ceiling. With so much pleasure. You have my deepest sympathies for your beloved collection. I am now going to check how secure all my artwork is around the house. Hopefully the storm is over and you'll be able to enjoy the fruit of your labor starting this weekend! Thanks for all that you do! I love your stories and how the designs are born. As crazy as your week was, you always have a calm and together exterior! Ohhhh, staring at the ceiling sounds just lovely! Add some music, maybe a sweet treat, and enjoy! You are such an inspiration. And reading that you listen to Jack White just made me adore you even more. OH my gosh, woman. You need a serious break. And not the kind that unexpectedly happened to you. I'm so sorry for this sucky week, and I do so hope this weekend will make up for it. Don't you have a birthday coming up? Please rest. Get a babysitter. And steal your husband away for some relaxation time. You deserve it! XO. Oh my goodness, you totally deserve a break. So glad not everything was lost on your mac! And I'm so sorry for the loss of all your vintage vases. Hope this weekend is full of relaxation for you! Woa my gosh, what a week! Calamity. The mirror is one serious calamity! Ok, and laptops are generally essential. Please enjoy a break, Anna!!! Good lord, how are you not either drunk or bawling? HI Marta :) I would say maybe an every OTHER day thing? haha, you know I can run, but going up and down the stairs to get coffee, huh? You poor thing, losing a favorite collection, a mirror smashed, over scheduling. Things will lighten up and you will be able to breathe. Oh no - sounds we are having the same kind of week. Here is to a fresh start this week. Have a wonderful happy relaxing weekend. Ugh and then double ugh. So sorry. My only thought is thank goodness it was your vase collection and not your son, daughter, daughter, son, daugher or dog(s) that perished. Many hugs coming from a very impressed mama that wished she had the drive and talent that you do. So lucky no one was hurt! I have a ton of vintage pottery-so I know what you mean. Yellow, and pale blues are my faves. Okay. You have the floor, and all rights to staring at the ceiling... what a week you have navigated! Ok, it sounds like you've had your run of back luck for the year - I hope you do manage to take time to relax and recover! Enjoy your weekend. I hope next week starts out better for you. Oh my... enjoy your weekend. You deserve it. My goodness you have been busy! What do you mean hard drives are lactose intolerant! Just kidding, I am glad everything was able to be saved, take some time and relax! You deserve it! When it rains it pours doesn't? Sorry you've had it so ruff lately. I bet you cried over those vases too, I would have. I'm sure next week will be better. Ceiling staring sounds like a good choice and well deserved. So sorry about your collection. Your chin up attitude is inspiring. Oh dear! Take the weekend off if you can! So sorry to hear about your collection. Yea! You get to redo you living room. Can't wait to hear/read/see about it. Yes, Jack White (smile) helpful guy/music. Used it myself before, fear of flying. His music got me through it. Glad you are surviving! ESP since I love your talent and desperately need your inspiration and instruction. Can't wait for your needlework book! I am crushed about your yellow vases...I remember a post which included a lovely photo of them....i am so sorry! Oh no! I am so sorry to hear about your yellow vase collection, I remember you blogging about how hard they are to find and how much you loved them. I am glad no one was hurt and that your kids (and doggie kids) weren't hurt when it happened. The plus side, you can paint the walls a different color again when you redo the living room, and we all know how happy painting the walls makes you! A good, long run in a thunderstorm...YES! Thank you for reassuring me that I am not the only one who has totally overbooked my summer, and that there are indeed moments (hopefully hours) of guilt-free rest and respite. May your downtime be indulgent and revitalizing! Ouch!!! Your poor head, I bet you are so happy to be done and have all those little Monkey projects off your back. Take some moments to sit still and recharge, you deserve the break. Maria, Could I ask you how deep your storage shelves are and how far apart the partitions are between the sections? Also what type of wood is it made from? 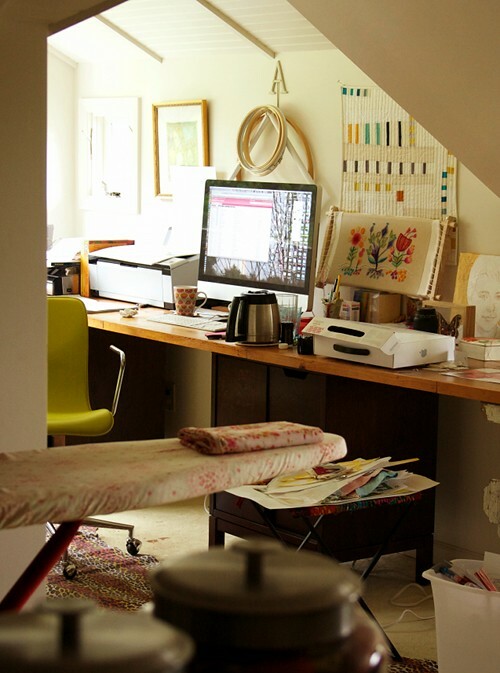 I drool over your sewing studio regularly. I too have a part loft to finish as a sewing/scrapbooking studio and would like one wall of this storage shelves too. I just need a little guidance please :).